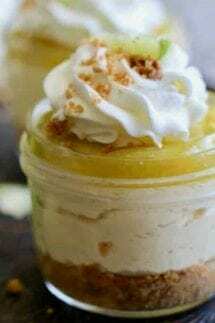 These individual Easy No Bake Mini Key Lime Cheesecakes are perfectly fresh with a side of tart and are ready in under 30 minutes! Combine melted butter, sugar, and ground graham cracker crumbs. Press about a tablespoon of crust mixture into the bottom of each jar; refrigerate while making the filling. Beat cream cheese until fluffy the gradually add sweetened condensed milk and beat until smooth. Stir in key lime juice, zest, and vanilla. Pour cheesecake filling over crusts. Top each cheesecake with 1 teaspoon of key lime curd. Cover jars with lids and refrigerate for at least 2 hours or up to 2 days. Right before serving, remove lids and garnish with a dollop of whipped cream and a slice of key lime.